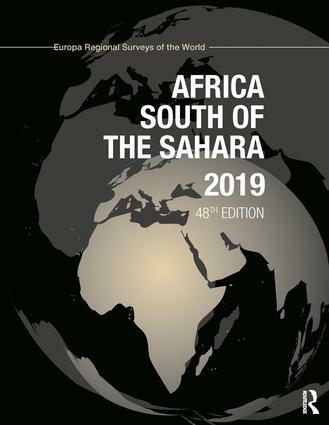 The definitive one-volume guide to all sub-Saharan African countries, providing invaluable economic, political, statistical and directory data. Thoroughly revised and updated analytical articles written by experts on the region and covering both continent-wide and sub-regional issues. a useful bibliography, providing sources for further research. Detailed information on regional organizations; commodities; research institutes; and select bibliographies of books and periodicals. Part 1: General Survey Part 2: Country Surveys Sections on geography, history, chronology and economy, as well as statistical surveys, directories and bibliographies for each country. Part 3: Regional Information Regional Organizations. Major Commodities of Africa. Calendars. Research Institutes Concerned With Africa. Select Bibliography (Books). Select Bibliography (Periodicals). Index of Regional Organizations.